Point E lies on the circumcircle of triangle ABC. 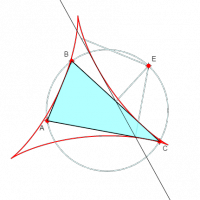 The projections of E onto the sides of the triangle are colinear. The envelope of such lines forms a deltoid curve. Try dragging E round the circle. Try dragging A B and C. Note that the envelope curve appears to remain equilateral.